This overview ended up looking very much like the one from a century earlier in the game. I still held my same five planets, and I was quite happy to have them intact. The Meklars had eight actual planets to their name; their ninth world, the Minimal planet just east of Rana, was the spud world that no one could hold onto for long (Paladia). The Silicoids and Meklars were clashing there, while the Psilons and Sakkra appeared to be fighting the cyborgs up at the top side of the map. The lizards had been reduced to their homeworld long ago, and it seemed unlikely they would manage to break free. I remained out of contact with them. 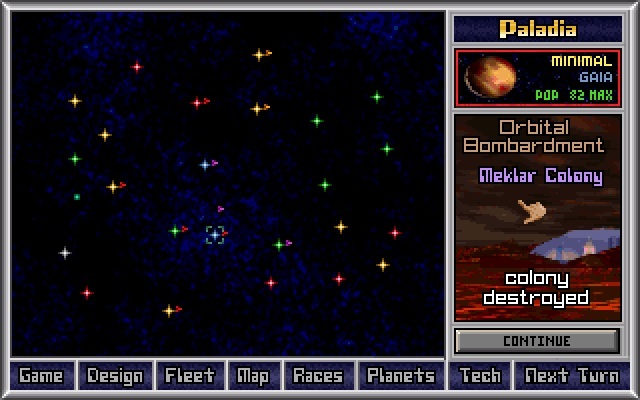 The Psilons and Silicoids both had two planets in their respective cores and a random third planet elsewhere on the map. This was essentially the same position as a hundred turns earlier, with the Meklars perhaps a little stronger and the rest of us collectively a little weaker. My next strategic goal was to run over the Silicoids to the south of me. If you look on the galactic map above, they had a Toxic Ultra Rich planet in the southwest corner, and then their homeworld of Cryslon to the east of that, also along the bottom of the map. Those were both extremely valuable commodities to control. If I could take those planets, I would likely have enough population for a veto block in the Council, and by virtue of being out of the way, these worlds would be less likely to come under AI attack. 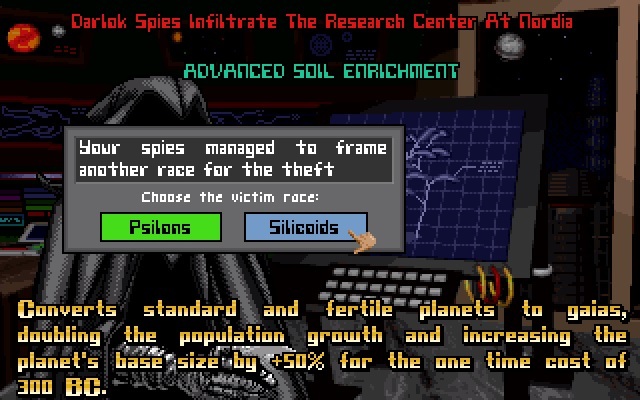 Hopefully the Silicoids would hold that world in the far northeast so that I wouldn't face the genocide diplomatic penalty for eliminating them. Furthermore, look at the Silicoid techs above. That was their research standing on Turn 2450. Only 4 points of shielding for their missile bases? Hyper-X missiles and not a single ECM tech for missile base defense? Duralloy Armor and nothing else for their ground troops? Yeah, this looked pretty doable. I had enough miniaturization at this point to fit a Fusion Bomb and the Inertial Stabilitzer onto a Small design for a combat speed of 4, and that would allow me to run around their slow missiles and bomb out the poorly shielded Silicoid bases. With the Autorepair special that I had researched earlier, I also put together a basic Huge design to provide some gunship cover. My plan was to use this interval of peace with the Meklars to conquer two Silicoid worlds, and then be in a much stronger position to take on the Meklars when we inevitably returned to conflict once more. 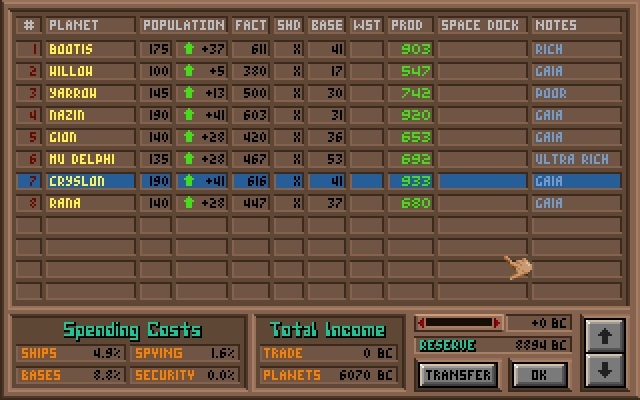 I sent population from every world in my territory, spending on the Eco slider to replenish the marines as they departed. Fortunately, the invasion of Mu Delphi went off even better than I had hoped. The Silicoids had 17 missile bases, and one round of Fusion Bombs from my bombers left them with a single missile base remaining. My only losses in fleet combat were a little over a dozen of my 400 Small bombers. In the ground invasion, my soldiers had a total advantage of +20, essentially turning my shapeshifters into the Bulrathi for this combat. The defenders fell easily and I had a new Ultra Rich planet at my disposal. 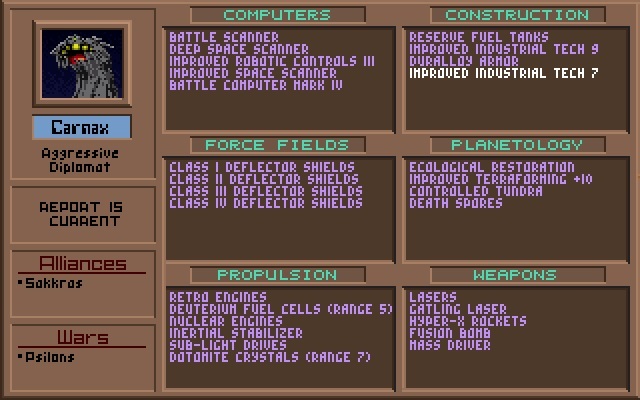 I captured two techs: Class V shields (brand new for the Silicoids and an upgrade for me) along with Improved Industrial 7. Unlike in some games, this attack hadn't been designed to capture technology, only to secure more territory for myself. With some additional terraforming, Mu Delphi would be an extremely strong planet. I mentioned before that I had been hoping for peace to last with the Meklars. I wasn't expecting it to last very long, but what I expected was more than what I ended up getting. Barely ten turns after I handed over the Inertial Stabilizer for a treaty, they declared war once again and were headed back for another row. Was it worthwhile to give up that tech? Even with the benefit of hindsight, I still think it was. Those 10-12 turns of peace gave me time to finish rebuilding factories and missile bases at Gion, and just enough of a window to take the prize of Mu Delphi. This was going to delay my offensive against Cryslon for a little bit, as I needed to ensure the safety of my own worlds against the Meklars, but I could live with that. There was still plenty of time before the next Council meeting. I made one other crucial tech trade in response to the Meklar attack. I saw that the Psilons had picked up Stinger missiles, and I traded them Improved Robotics III for the weapon tech. In an instant, the damage from my missile bases essentially doubled from 8 per shot to 15 per shot. With the Meklars packing stronger armor and better shielding, this was exactly what I needed to fend them off in this renewed bout of combat. I'll cite this as another example of why it's important to watch the diplomatic screens closely. Even though the AI will always ask for disadvantageous tech trades from a pure numbers perspective, it still tends to be worthwhile for the player to engage in them frequently. 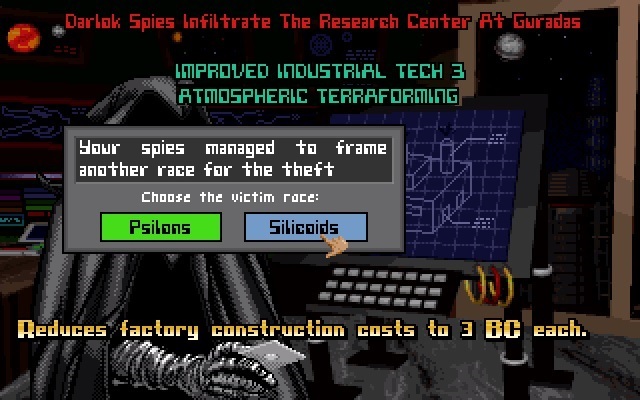 The Psilons were a weak empire that posed no threat to me, and giving them access to more factories was a trivial handout in return for a critical upgrade to my missile tech. One of the things we often do in variants or succession games is to take tech trades off the table, and it certainly makes the game harder. This was not a variant game though, and I used the tools that I had available. Another 33 Large ships this time, nothing to be taken lightly. However, there were two key differences this time around in this new era of Meklar warfare. The first difference was that my own defenses were far stronger, in particular the use of Stinger missiles instead of Hyper-Vs. I fired on the Annihilator stack first, and one volley of Stingers managed to kill 4 of those ships. That was a major difference from the results with my previous set of missiles. The second difference was that the Meklars now had a new weapon on hand in the form of Scatter Pack VII missiles. Those were deadly for their missile bases, but irrelevant against my own planetary defenses. I've noticed that the AI tends to emphasize ship designs based on their most recently discovered weapon, which is logical and a good decision from a programming perspective. Earlier, the Omega-V Bomb was their top tech and every Meklar ship was packing it, much to my chagrin. Now their new ships were packing missiles instead, and those Scatter Pack VIIs were vastly less dangerous. The Meklars would build hundreds of those Ajax ships (I saw one stack get up to 150 them later), and they were all useless at attacking my worlds. I could ignore them completely and focus on the older - and much scarier! - Nemesis and Annihilator designs. That's not to say there was no danger in this war. 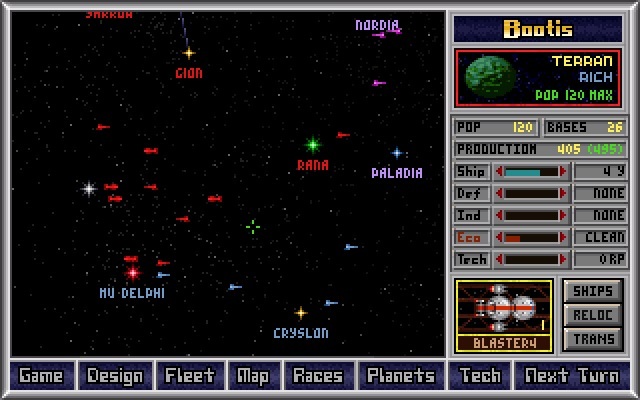 This battle at Nazin was a touch-and-go affair where I barely managed to kill off all the ships with Omega-V bombs before they could destroy the planet. I won the encounter with a mere 4 missile bases left; the Nemesis stack and my bases were each hitting one another for the last few turns, each of us losing strength, and they barely failed to break through. Still, as the war continued and I destroyed the older designs when they attacked my planets, I saw fewer of the old Omega-V designs, more of the new Scatter Pack VII designs. The older ships would refuse to retreat from battle and die, while the newer ships escaped to keep their numbers high. I was fine with this, content to protect my planets, even though I had no prayer of challenging the Meklars in fleet to fleet combat as yet. With the top scanner tech, I had plenty of time to see where the Meklars were massive their ships with dangerous designs and prepare my defenses accordingly. The war even became somewhat routine. Briefly delayed by the Meklar war, my small navy returned to the process of crushing the rocks. While Cryslon had 40 missile bases and over 100 population, the Silicoid homeworld fared no better than Mu Delphi. The rocks were simply too far behind in tech to put up much of a fight. 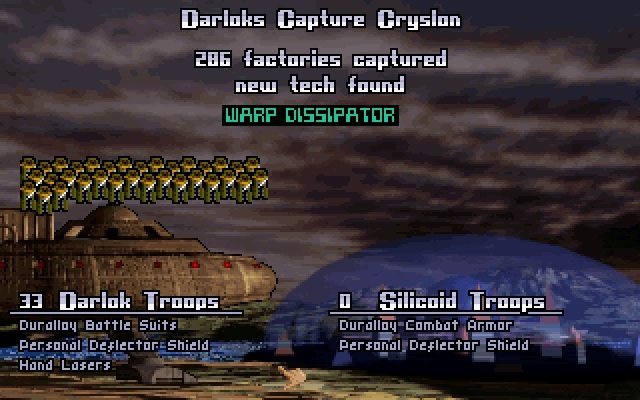 They even gave me another useful tech in the invasion in the form of the Warp Dissipator. I actually felt bad about invading them since we had been allies for much of the game, but I did need those planets for myself. At least the Silicoids continued to survive in the far northeast corner of the galaxy, where they had a Radiated planet that the Meklars were ignoring due to lacking the environmental tech to colonize it. I had no difficulty using the captured factories to stand up Cryslon and get two dozen missile bases in place for defense. I would have gladly signed peace with the Silicoids at this point, except that we were no longer in contact. Well, they wouldn't be voting for me in the Council, that's for sure, but there wasn't much damage they could do with only 1 vote. I wanted to hit the Meklars at Paladia next, the planet just to the east of Rana that had been a hot potato disputed world for most of the last 50 turns. The Meklars had only managed to get 4 missile bases there, and it seemed like an easy place to hit them with my bombers and inflict some pain, maybe even capture the planet myself with transports. I had no trouble maneuvering my stack of 400 Small bombers next to the planet... only to find that dropping all those bombs did 50 damage and killed zero bases. Whoops. The Meklars had Class X Planetary Shield and 16 total points of shielding, rendering most of my Fusion Bombs useless. Making matters worse, they had some fairly advanced ECM techs (I think it was ECM V) while I had only the most basic Battle Computer on my Fusion Bombs due to the need to fit them on a Small hull. Long story short, my stack of bombers that had trashed the Silicoids with ease couldn't even scratch a measly 4 bases on a developing Meklar colony. That's the power of technology in this game. 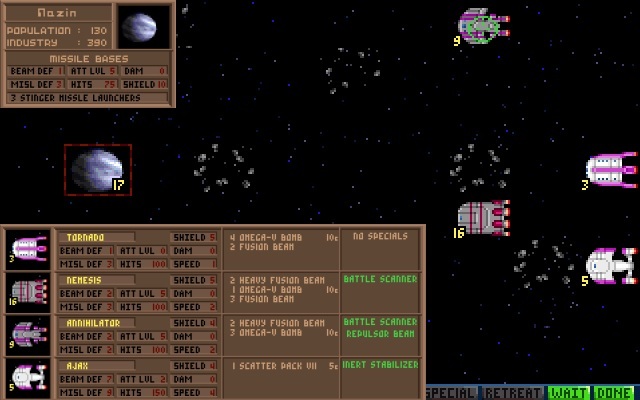 I lost several hundred bombers to Scatter Pack VII missiles and retreated as fast as I could. 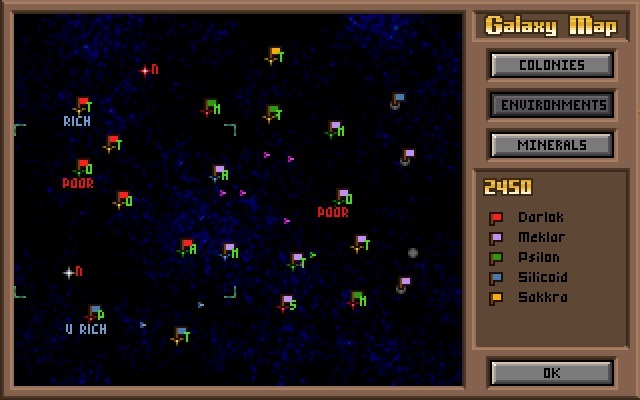 Willow was the Tundra planet from the early stages of the game that had been first colonized by the Psilons, then heavily fought over by other races afterwards. I snuck up here and bombed out a fledgling Meklar colony, then replaced it with a colony of my own, starting from scratch with a new colony ship. This brief period of peace kept the Meklars from attacking me, and the Psilons and Sakkra were much too weak to try and contest my claim. As a result, I was able to pull this off without any real difficulties, sending 22m population from Nazin each turn (the most I could regrow in one turn of Eco spending) until Willow was full and doubling production every turn with the Reserve. Having Improved Industrial 3 also made for some very cheap factories too. Even with Improved Robotics IV now in hand, those factories still only cost 6 BC apiece, and I had enough Planetology tech by now that population itself was producing a lot of income. A dozen turns was enough to get Willow into a position where it could start defending itself. In the 2475 election, I managed to reach a veto block for the first time with 8/23 votes (35%). It was close enough that I could fall below the critical threshhold if I were to lose some planets or the Meklars gain additional terraforming technology, although the cyborgs already had Advanced Soil Enrichment and Terraforming +60 in hand, making it unlikely that things were going to get much worse on that front. I would almost certainly be able to steal those techs for myself before they could advance onwards to something like Complete Terraforming. This was not a close or dangerous Council election, as I also pulled votes from the Psilons and Sakkra. I still wasn't close to winning (the Meklars held their own 1/3 veto block with roughly half of the total population), but at least I wasn't in danger of losing any more. Most of these ships were irrelevant, with both the 35 ship stack and the 108 ship stack (the Ajax design from earlier) packing nothing but Scatter Pack VII missiles. 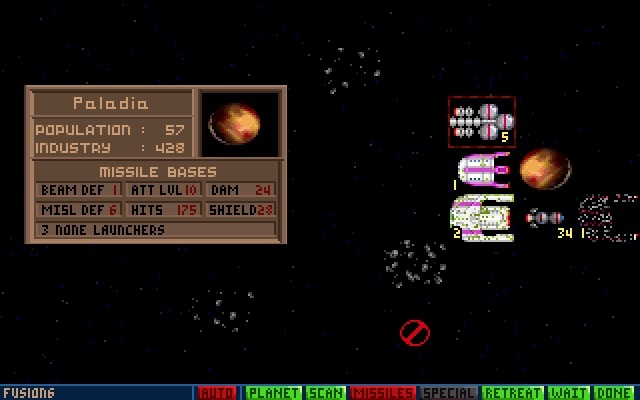 Tons and tons of those missiles, but not dangerous to planetary defenses. The new Devastator design was carrying 12 Omega-V bombs apiece, however, and those were more than enough to overwhelm the 15 points of shielding that I had for my bases. Now a dozen Omega-V bombs might not sound that bad, and if it had been only the weapons themselves, this wouldn't have posed a problem. The danger on the Devastator design came from the Huge hull with 1500 HP (Andrium armor), the combat speed of 3 to close with the planet quickly, and worst of all, the Cloaking Device special. That ensured that the enemy ship would take almost no damage until it decloaked to begin attacking, leaving no time to stop the bombs en route. Oh and hey, there's that Inertial Stabilizer that I traded the Meklars earlier. Be careful what you send the AIs in this game when making tech trades. The AI had put together a genuinely scary design here. 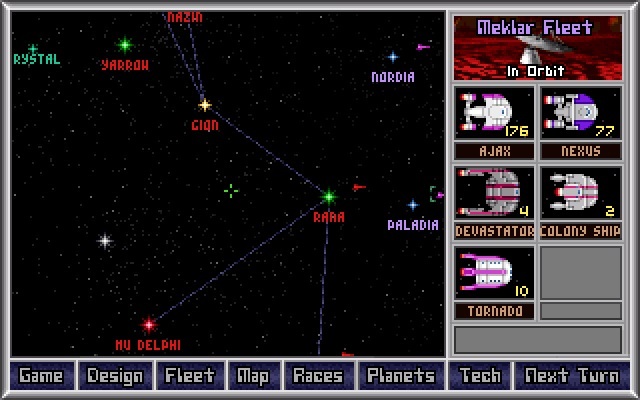 I had earlier borrowed a tactic that I saw from some of the other players at Realms Beyond: sending a ship with Battle Scanners to check out enemy ship designs whenever a new one shows up, and that was the only thing that saved my planets. As soon as I saw what the Devastator was packing, I immediately began building missile bases on every planet, needing to increase from the dozen or so that they mostly had at this point up to 35 or more bases. There was no fooling around with this ship. I snapped this picture at Cryslon, where I had received a single turn's worth of warning of an incoming attack and used that to stack up another 13 bases to reach an even 50. While this might look like overkill, those three Devastators killed almost 20 bases between them, and that despite Cryslon having Planetary Shield X technology and Zortrium armor (which I had stolen from the Meklars, naturally). If I had started the battle with only 30 bases, I would have lost this world. Sheesh. Chalk one victory up to defensive paranoia on my part. Definitely no more threat of losing the Council vote any longer. I'll point to two more things on this screen that hold some interest. One is the Planetary Reserve, which ended up with a massive total. Since I had no ship design to build at the moment, I was having my Rich and Ultra Rich planets feed the reserve each turn. The Meklars had also given me something like 8000 BC when they offered me their previous peace treaty, which I didn't even realize at first since there was no message indicating as such. This was honestly more Reserve than I needed, and I was spending as much as I could each turn to double the production of every planet doing research. I only needed a few thousand BC on ice for emergencies, and I might as well get some use out of the rest. The other item of note was the hefty base counts that I had stacked up across my empire. Those Devastators were no joke, and I needed to be prepared to fight them off. The Meklars were still building them, and every time they attacked I would lose some missile bases before I could destroy the ships. Gion fought two of them and lost about a dozen bases, for example. Better safe than sorry here. We were still locked in this duel at the time of the 2500 Council election, with the galaxy almost entirely divided between Meklar east and Darlok west. I would say it was a form of Cold War, except that there was nothing cold at all about the attacks that the Meklars continued to launch against my territory. The other three races had been rendered irrelevant at this point, bystanders in this conflict between shapeshifters and cyborgs. I was content to leave the three weak races there on their individual worlds, even though it would have been fairly easy to take Sssla or Mentar. 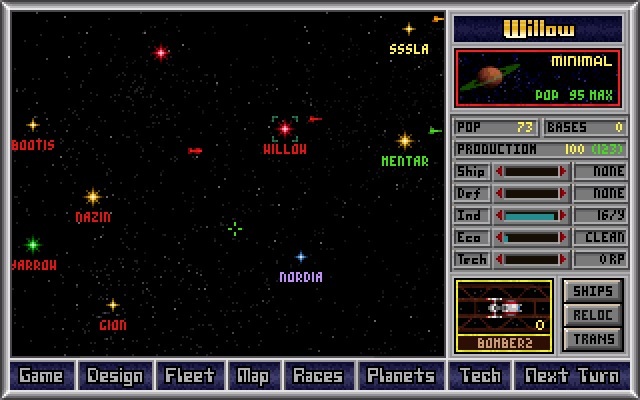 Conquering those planets would not be enough to win the game though, and I could secure their votes pretty easily in the Council by bombing the Meklars. No, in order to win this game I needed to climb the summit and defeat the Meklars themselves, not engage in further proxy wars. I just needed a weapon capable of cracking their defenses, and that meant either researching or stealing the Omega-V Bomb technology. Until that happened, I continued to protect my own planets and play the waiting game. I put together two basic designs, a Huge Autorepair gunship to engage in fleet combat and a bomber to deal with planetary defenses. 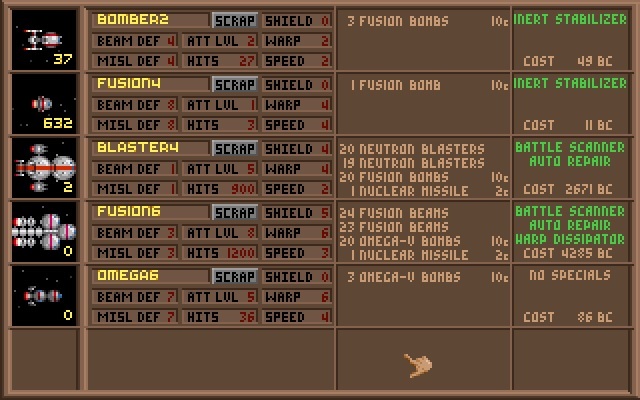 The Fusion6 design works off of a template that I've used for years: the best computer and shielding available, two racks of guns, one rack of bombs, and then a token missile that can be togged off to be able to move and fire without immediately ending the ship's turn afterwards. I usually try to reach a tactical movement speed of 3 with these ships, as I've found that the extra cost and space required by going up to 4 movement points generally isn't necessary. Bombers that want to target planetary defenses specifically, those are the ships that need a movement speed of 4 to be able to reach the planet's surface in two turns of combat. That was what I used for my Omega6 bomber; I had to use a Medium hull because the Omega-V bomb was still too large to fit on a Small hull. I would need several hundreds of these ships to stand a decent chance of cracking a fortified Meklar world. Having Ion Engines (warp 6) tech was a major help though. I had picked that up in a trade with the Psilons, as the brains had somehow managed to come up with excellent Propulsion tech in this game. On my Huge gunship, I had also added the Warp Dissipator, one of my favorite specials and something that had become quite cheap by this point in time. 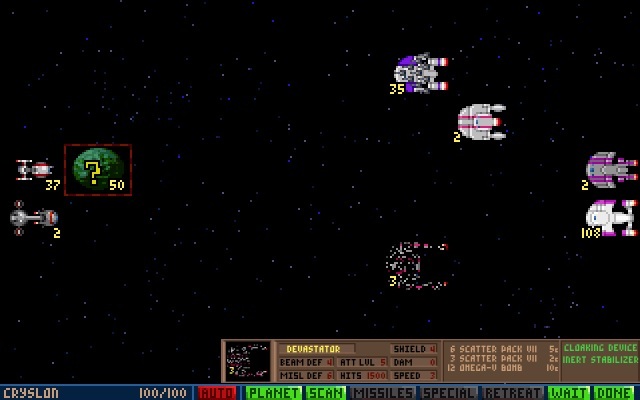 The Warp Dissipator ensured that these Fusion gunships would retain utility value for a very long time, still able to slow or freeze enemy ships in place long after this design's combat effectiveness had gone by the wayside. I immediately began shipbuilding these two designs in earnest across my empire, with only the smaller planets remaining on research. That was their biggest grouping of ships to date, located over Paladia just to the east of my territory. 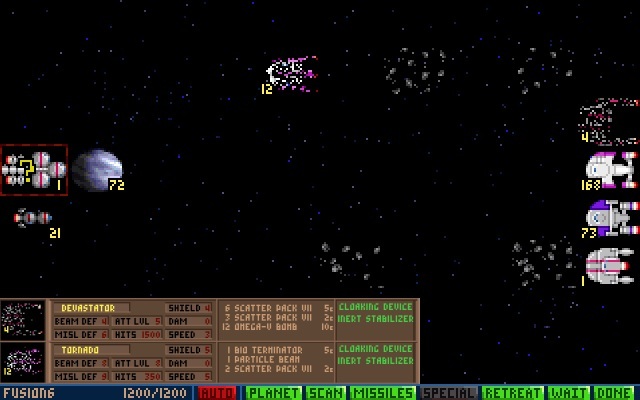 While the Ajax and Nexus designs carried only Scatter Pack VII missiles and were therefore irrelevant to my planetary defenses, I worried greatly about the four Devastators and whatever those Tornadoes were packing. I sent a gunship with a Battle Scanner to check them out, and discovered a new threat: each ship was carrying a Bio Terminator. 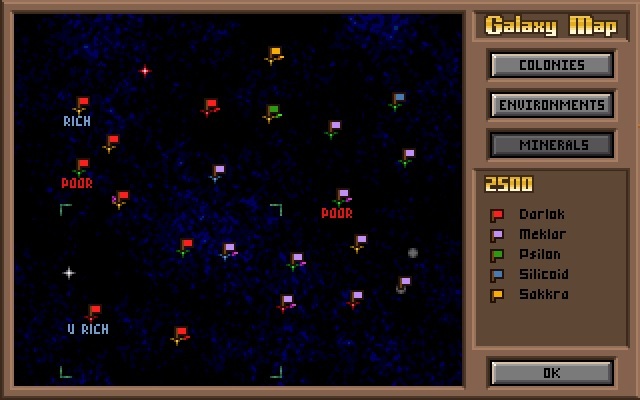 That's the tier 3 version of Death Spores, each bomb holding the capacity to kill up to 3m population. I had no antidote tech at all, and this was a dire threat indeed. If the Meklars started building those ships in the dozens, they would have the potential to wipe out any of my planets at will. Oh, and wave hello to the Space Crystal as well as it passes by. We were indeed getting quite late in this game, weren't we? It was headed for the white star that held no planet at the moment, but it would eventually head after one of my worlds a bit later. I pasted in the stats on the two enemy ships that were the threat here. The Cloaking Devices made those ships very difficult to hit until they decloaked to attack, and the Inertial Stabilizer ( ) boosted their combat speed. The Tornado had a tactical speed of 5 moves, sheesh! Notice the health on those ships too: the Tornado was packing 350 HP on a Large hull, a sign that the Meklars were making use of their Adamantium armor. Nasty ships to deal with. I had to focus my initial Stinger missile volleys against the Tornados to prevent Mu Delphi from being destroyed by biological warfare, and that allowed the Devastator stack to get in some choice licks with its Omega-V bombs. Long story short, Mu Delphi did survive but it was a near-run encounter, with more than half the population killed off and some 35 bases destroyed. I would flood in population from the nearby planets to repopulate the world, and as an Ultra Rich colony it could rebuild the bases without any trouble. On the positive side, I had also shot down all of the Devastators and Tornados in that big stack, and the Meklars would need to take some time to reload before they could attack again in such force. I worried about what would happen if they hit me away from an Ultra Rich world though, such as at my one Poor planet. There were limits to how many bases I could construct at some of my weaker holdings. I went into this battle with almost 400 Omega-V bombers, which I thought would be sufficient to deal with the roughly 20 bases protecting Paladia. This was the weakest-held planet that the Meklars had on my side of the galaxy, and it seemed like the easiest target to go after. Unfortunately, the Omega-V bombs did less damage than I was expecting against the 28 points of shielding that they had on hand. When I ran the numbers for this report, it turns out that the average damage per bomb was only about 8 points, and my to-hit ratio was only 60%, for an expected damage per bomb of about 5 points. Add in the Adamantium armor on those missile bases for 175 HP per base, and even dropping several hundred Omega-V bombs in the first volley wasn't all that effective. In the end, I did manage to take out the missile bases, albeit at the cost of nearly all of my bombers. That had represented a major capital investment, the production total of several different planets for most of the last dozen turns. All that to wipe out the defenses of a single, weakly-held Meklar planet. And that was a major gain. Instead of being a firmly held Meklar colony, Paladia went back to its earlier role as a hot potato. If I could manage to distract the Meklars with other tempting targets elsewhere, I might be able to plant my flag here and stand up the new colony. At the very least, I had denied them another place to conduct research and build more ships. This was the first time that I had definitely hurt a "real" Meklar colony, and not a fledgling startup. That was a sure sign of progress. While I wasn't happy to lose so many of my ships, it was still a small step forward.